At 2 to 3 years old the child learns continuously by virtue of an absorbent mind, in their interactions with others and their environment. Through experience they become independent and build up intelligence and skills for the rest of their life. Their aim: shape themselves. Hence, we are particularly careful to provide a calm and orderly environment to help the child in organising their knowledge. The Children’s community is specifically created to suit the child’s curiosity and their need to explore everything in their vicinity. They go through sensitive periods which are the chance to naturally succeed in learning, together with an adult. At nearly 2 years old, children learn spoken language really quickly and easily, arousing the child’s interest to know and name everything. It’s also the ideal age to easily learn a second language. Our Children’s communities have about 12 children with 2 adults looking out for the wellbeing of each individual. 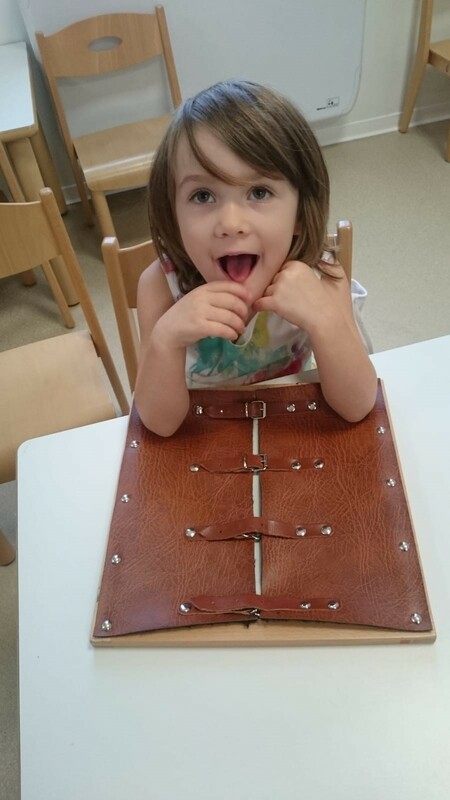 The material is made to suit the size and strength of the children. It is presented on individual trays and carefully considered to stimulate the mind and improve movement. During this fragile period in the child’s life, adults give the child the time they need, to progress at their own biological pace. The care given and the quality of relationships nurtures their self-confidence and their confidence in life. From a very young age children learn to choose what they will work on. They are encouraged to carry out practical life activities by themselves to gain independence. Very simple exercises are shown, such as; carry a fragile object, pouring, folding etc. 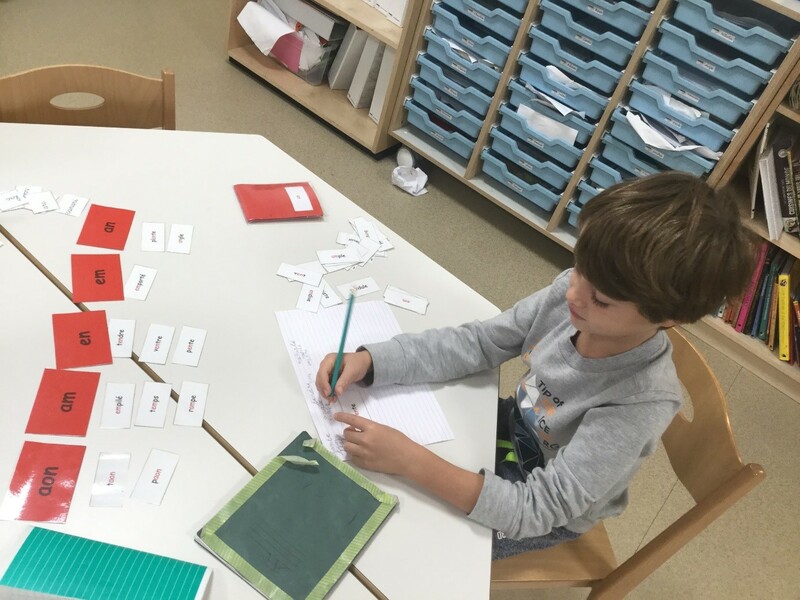 Activities are presented, on a daily basis, to enrich vocabulary such as; classified cards, books, stories in sequence, describing pictures and the sound game. There is also an area dedicated to hand-eye coordination with puzzles, screwing and unscrewing, sorting trays, cutting and sticking. Art and music is a part of the children’s daily experience. 11 :30 – Lunch in a positive atmosphere with conversation. Children serve themselves and clean up. The children’s house is especially designed for children from 3-6 years old. They are sensorial explorers, building up know-how and interpersonal skills. Maria Montessori’s ultimate aim is to create peace makers for a better world. 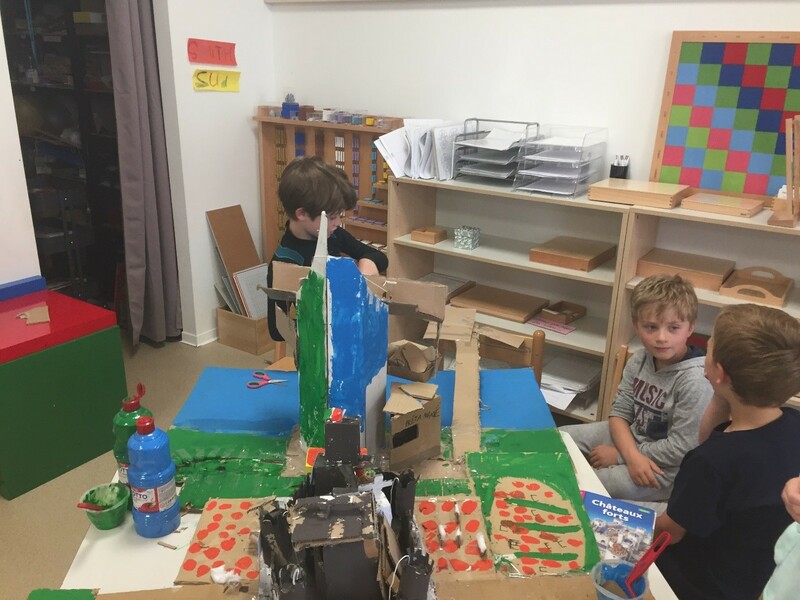 Everything is put in place to support the children’s inner construction applying their own inner drive and opening them up to a world they will be a part of when interacting with others. Learning concepts and then the passage to abstraction happens through manipulating real objects. The hand is the extension of the mind, the child remembers and integrates concretely in their brain everything that they touch. 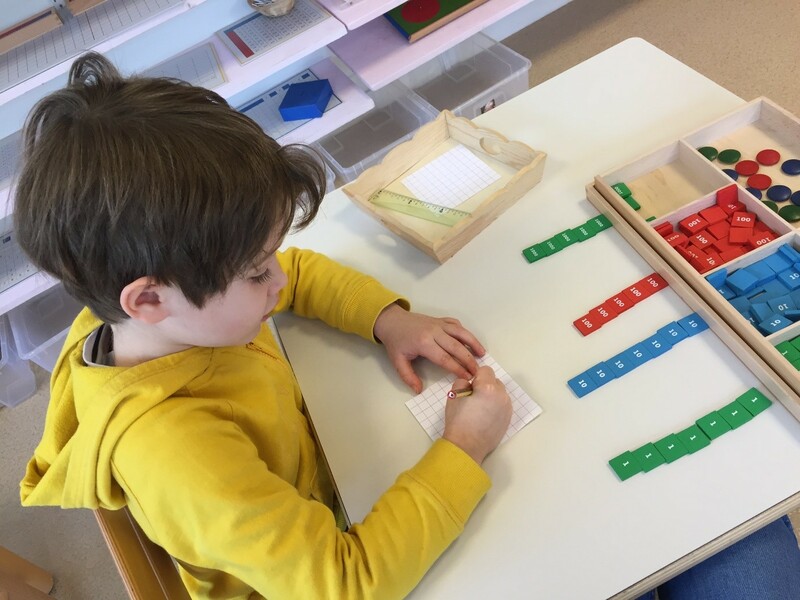 From 3 years old the child is indirectly prepared to write and build up logic through activities organised in a structured way. 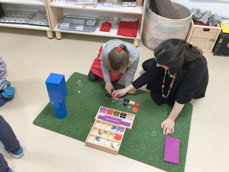 Each activity has its own self-correcting element so the child can make mistakes and start again as often as they wish, completely independently. The activities were created scientifically so the child acquires all the basics, in particular, of maths and geometry. 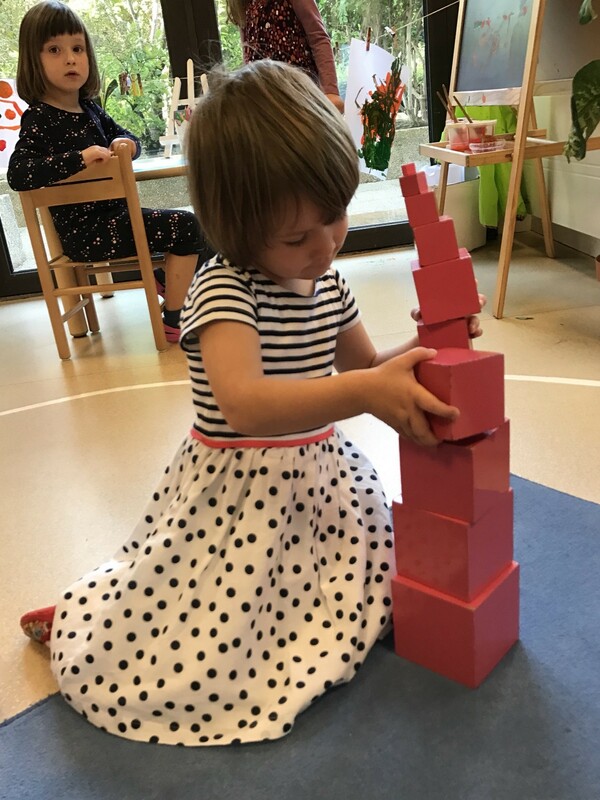 In the practical life area, the child carries out everyday tasks, the simplest (only one action) to the most complex (several actions in a row) using organisational skills. Each activity is very real with a point of interest that the child will try to achieve. There is a lot of repetition, concentration and autonomy. Sensorial activities develop intelligence and refine the senses. It’s a springboard to the mathematics activities. The language area helps the child to enhance their vocabulary, formulate their thoughts, differentiate between sounds and associate them with letters in a kinaesthetic way. Mathematics is learnt with the senses, analysing complex realities through simple and isolated elements. Children have access to art and music every day. 11 :15 – Circle time around the ellipse to talk about life in the class, read stories, sing and lay the table. Older children go back to working individually on activities. From 6-12 years old the child builds up independent thinking. 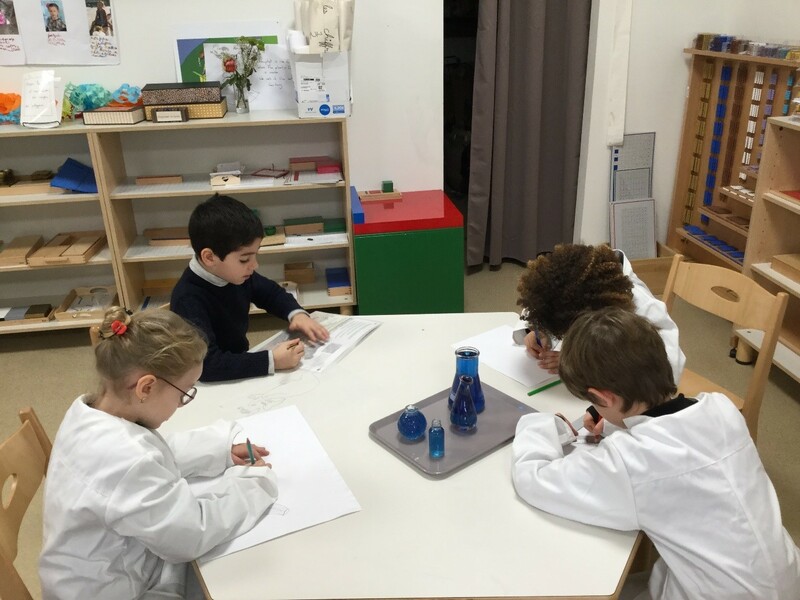 The aim of Montessori Elementary School can be summarised in the phrase ‘help me to think by myself’. 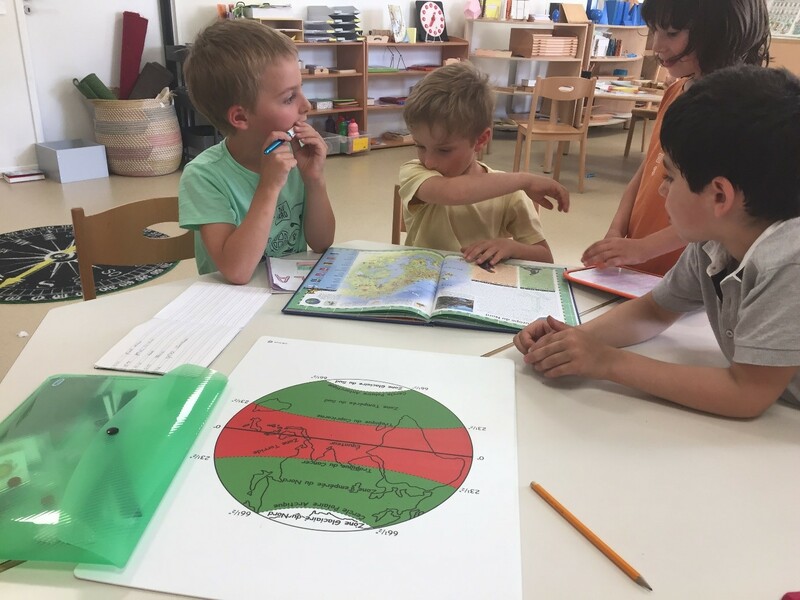 Maria Montessori puts forward a ‘cosmic education’ implied to be ‘universal’ which seeks to include the child in their society, the history of their planet, their country, their language, the numbers they use as well as animals and plants around them. As such, the child becomes aware of what they owe to those who were there before them. One of the significant characteristics of the 6-12 year old child is their great imagination. It enables them to understand what is not visible or directly perceptible through the senses, i.e. to be able to understand the abstract. The 6-12 year old child is curious and open to all types of learning. It is the ideal time to learn about culture. 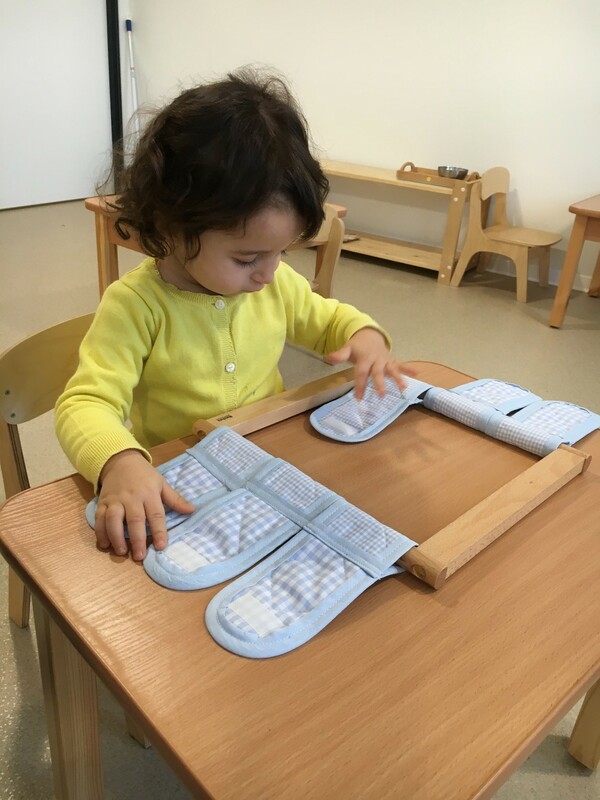 Montessori education offers a complete, coherent and unified vision of the world. The 6-12-year-old child also has a great sense of justice and little by little gains moral consiousness. The class is a minature society divising its own laws and rituals. It is prepared by the adult to encourage group work. It is a place where children are free to express themselves and exchange ideas to develop reasoning and social relations. It is a time for big friendships. Life in the class should be organised in such a way that the child is helped to choose their work freely. They can therefore work spontaneously and ‘passionately’ for long, uninterrupted periods of time. However, this liberty goes together with responsibility, in order to help the child work towards being more independent. 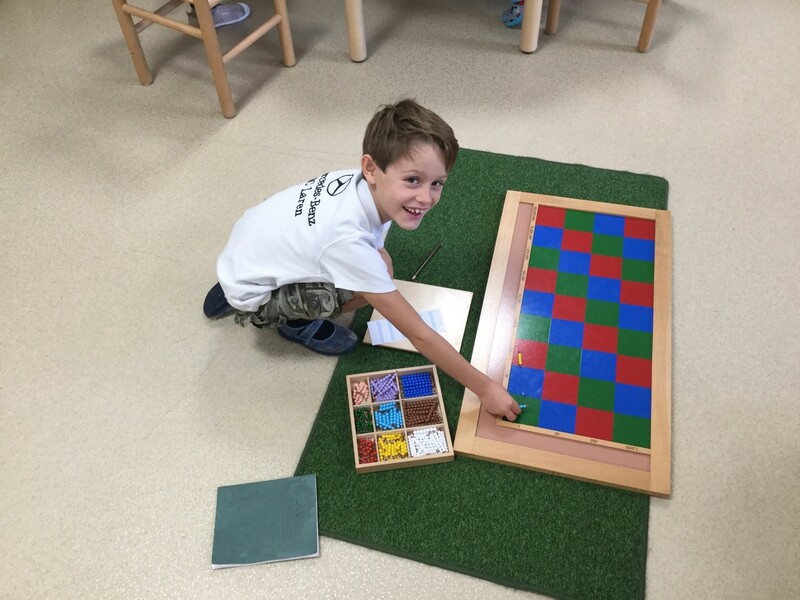 The Montessori activities satisfy the child’s curiosity and cultivates their need to research. Maria Montessori aspired to fire the 6-12 year old’s imagination. Therefore, Elementary school work is based on the history of the universe. The main aim is to arouse the child’s curiosity, interest and amazement. The guide simply sparks the children’s interest and makes them want to know more, which leads them to more questioning and research. 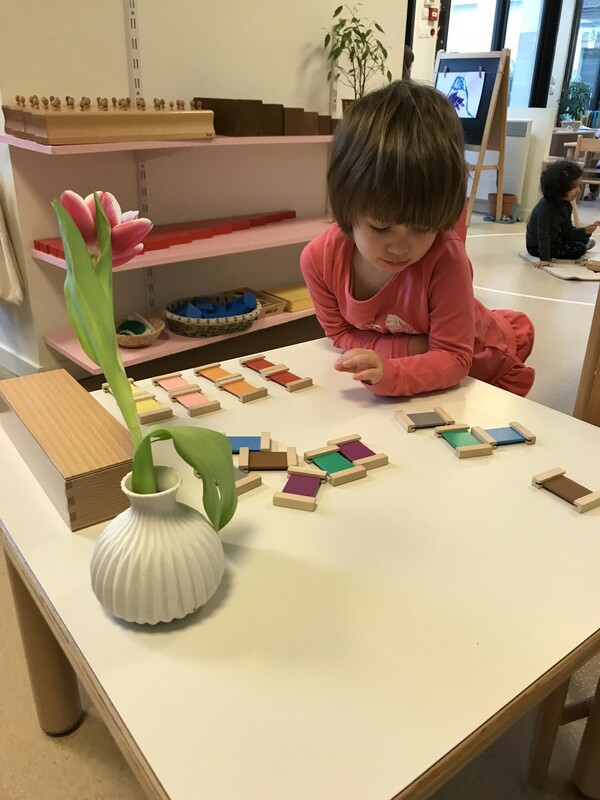 The Montessori program is centred around 5 main lessons given at the beginning of the year ; the creation of the universe, the evolution of life on earth, the arrival of man on earth, the history of the written word, the history of mathematics. Each of these 5 important stories open up new fields ; Geography, History, Biology, Geology, Ecology, Mathematics, French and Literature. The guide makes sure each child covers all parts of the program. 8 :30 – Your child is greeted in the class. They can then either freely explore an activity that they have already been presented or continue work already started. They choose to work alone or in a group. Everything is done to provide what is needed to develop the child’s knowledge and creativity. Guides help with organising work, methodology and following class rules. 11 :30 – Circle time around the ellipse to talk about life in the class, start a debate, read in pairs, sing and lay the table. 12 :45 – Lunch in a group. Children serve themselves, clean and wash up. 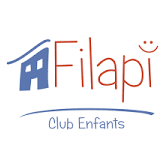 Le mercredi et pendant les vacances scolaires notre partenaire FILAPI, club d’enfants, propose aux enfants des activités extrascolaires ludiques et créatives.